Dogs are meat eaters by nature - meat is what they naturally crave! 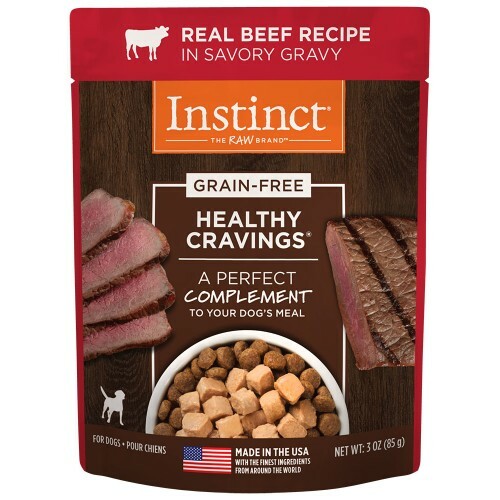 Instinct Healthy Cravings provides wholesome, tender beef in savory gravy for a healthy and delicious mealtime experience. A perfect meal enhancer or topper to your dog’s kibble. Beef Broth, Beef, Chicken, Beef Liver, Eggs, Pea Flour, Natural Flavor, Sodium Phosphate, Guar Gum, Salt, Sodium Carbonate, DL-Methionine. 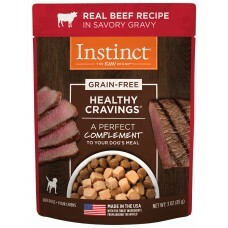 Instinct® Healthy Cravings™ Tender Beef recipe for dogs is intended for intermittent or supplemental feeding only.